Victory at Ware on Saturday afternoon combined with a Waltham Abbey loss saw Hayes & Yeading United move to the top of a league table (excluding after the opening match) for the first time since United defeated AFC Wimbledon 2-1 at Church Road back on 20 September 2008, it been a long time coming. 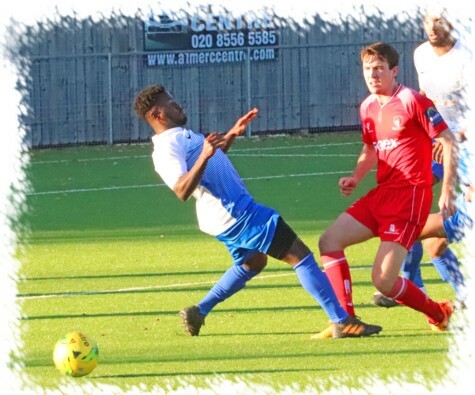 Manager Paul Hughes retained the starting XI that had thumped Uxbridge four days earlier, the only squad change seeing a fit again Toby Little return on the bench in place of George Ademiluyi. United started quickly, creating two half chances in the first four minutes. First up was Ed Asafu-Adjaye running towards the Ware box, his 20 yard shot being held by ‘keeper Anthony Page at the second attempt and this was quickly followed by Scott Bridges heading the ball across the box towards Lee Barney but Page grasped the ball as United’s top scorer slid in. On ten minutes, a long range effort from the home sides’ David Cowley was deflected wide by a well timed Liam McDevitt interception and nothing came of the subsequent corner kick. As seems to have been the case in a few matches recently, the opposition had a fair share of the ball but rarely troubled the United back-line or Jack Smith in the goal and it was the 25th minute before another opening was created and again it was United pressuring the home goal. Tom Jelley collected on the right side, his centre was flicked on by Josh Chamberlain in the middle and collected by Barney who forced a good save from Page with the offside flag being raised as Hassan Jalloh arrived to try to net. Minutes later Jalloh fed Chamberlain on the left flank, his cross was knocked down by Barney to skipper Scott Donnelly whose laser guided foot was a little off target today as his effort just cleared the crossbar of the Ware goal. Six minutes from the break United deservedly took the lead. Jalloh won possession and moved inside from the left channel, his shot was pushed out by the diving Page but that man Barney was quickly on hand to reclaim the ball, turn and fire home from close range for his seventeenth of the season. Just before the break United almost had another as Bridges won the ball in the middle of the park and exchanged passes with Barney before sending him away on the right side, Barney’s driven cross from the bye-line flying across the six yard box without the required touch. There was still time for the hosts to go close to pulling level in added time as a deep Cowley cross from the right side was headed across the six yard box by Louis Blake, a gaggle of United defenders doing well to prevent Albert Adu from getting the vital touch as referee Wilson waved away vociferous appeals for a penalty kick and United went in a goal to the good at half-time. The second half was to belong to United as Paul Hughes’ side controlled the game almost from the re-start, even when the home side did have a spells of possession Smith was rarely troubled in the United goal. 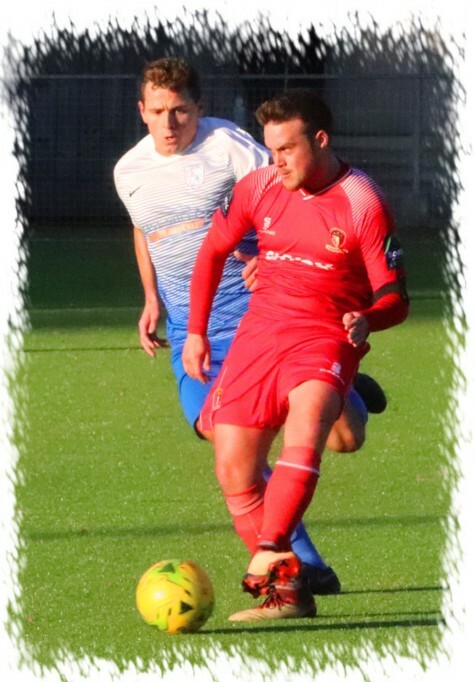 A couple of minutes in a nice passing exchange that included Jelley, Jalloh and Bridges saw the later fire in a deep centre that was brought down by Chamberlain, his shot beating Page only for Ware skipper Gareth Madden to clear the ball of the line. Barney was then too high with a header after good approach play from Jalloh and Bridges before Page was again called into action, this time to push away a Jalloh drive after he had been set up by Bridges. Nineteen minutes remained and United had a bit of a let off as the home side were nearly presented with an equaliser in the freakiest of ways, Smith raced out to clear a long ball to the left of the United box, his clearance smacked into Priestley Farquharson and the ball flew across the United box to Adu who thankfully fell over before getting a shot away and Chamberlain was on hand to clear the danger. Seconds later Donnelly collected just outside the Ware area and forced a diving save from Page who minutes later helped to contribute to United’s second. Jalloh fed Donnelly, his curling pass to the edge of the box saw Page and his defender hesitate allowing Barney to nip in between them and take the ball away to the left, the United hotshot turning to fire under the recovering ‘keeper for number eighteen. Page kept the deficit at two a few minutes later as substitute Toby Little pulled the ball back from the left wing to Bridges who turned his marker and fired goalwards only for his effort to be blocked away by Page. 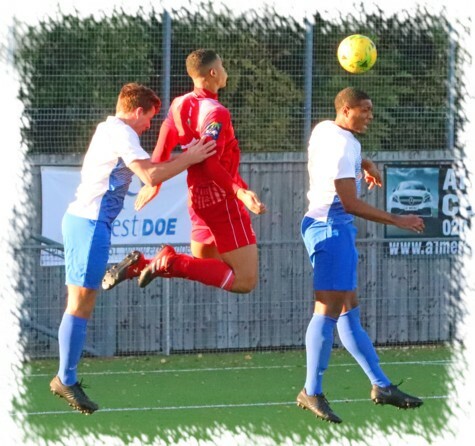 Number three for United came in the 90th minute as Ed Asafu-Adjaye fired across a fine cross field pass that Barney knocked down to substitute Duncan Culley who made no mistake from just outside the six yard box. There was still time however for the home side to net a consolation goal and miss a penalty in the six minutes of stoppage time that followed. In the third minute of additional time, a needlessly conceded free-kick 20 yards out saw Alaa Oujdi fire the ball past the United wall and in off the crossbar and a couple of minutes later referee Wilson pointed to the spot after Oujdi was adjudged to have been impeded in the box. 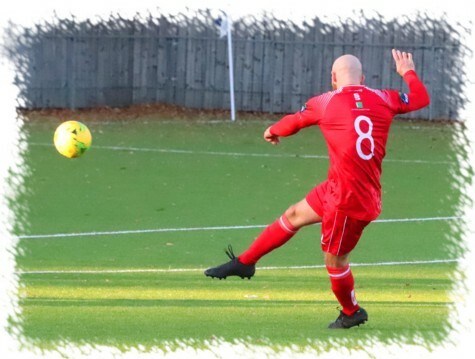 Jordon Watson stepped up and fired the kick high and wide of Smith’s net and United secured a ninth consecutive win in all competitions to move top of the Bostik South Central table ahead of Bracknell Town on goal difference. United Man of the Match: Hassan Jalloh.